Luxury homebuilder Florida Lifestyle Homes has completed a new furnished estate home, the Casa Kae, at Quail West Golf & Country Club. Located on a lake view home site, the Casa Kae is an elegant design with exceptional features. The home offers four bedrooms plus a study, and five full baths plus one half-bath in 5,820 square feet of air-conditioned living space. With two lanais, a covered entry and a four-car side-entry garage, the Casa Kae includes 9,080 square feet under roof. The home is offered at $4.495 million, designer furnishings included. The home has a great room design offering both a formal dining room and a breakfast room with vanishing corner glass that opens to the lanai and pool. There is a separate wine storage room. The gourmet kitchen features a large island and a butler’s pantry with an urban cultivator to provide the serious cook with the freshest of herbs. The study includes a unique secret room, accessed through a built-in cabinet with a passageway to a master bedroom closet. For more casual moments, there is an entertainment room complete with a large full bar with back lighting. Entertainment features include a card table, sitting area with chess, a television and a shuffle board table. This room also features a vanishing corner of glass that opens to the lanai and pool, expanding the space. There is a full bath that may be accessed through the game room or from the pool, doubling as a pool bath. The master suite occupies one wing of the Casa Kae, providing a tranquil retreat. The his-and-her baths are connected by a walk-through shower and provide the relaxing features of a spa. A freestanding soaking tub is the centerpiece of her bath, which includes dual vanities, one offering a seated dressing space, a private water closet with bidet and a large closet with dressing space. His bath features a vanity, private water closet and large walk-in closet. The sauna in the master bath retreat is a chromotherapy dry sauna. There is also an outdoor shower in a private garden, enhancing the relaxing ambiance of the master suite. Each of the three guest bedrooms includes its own private bath and walk-in closet. Two of the guest suites access an outdoor courtyard garden with an impressive water feature that has a sheer waterfall. There is also an outdoor shower. 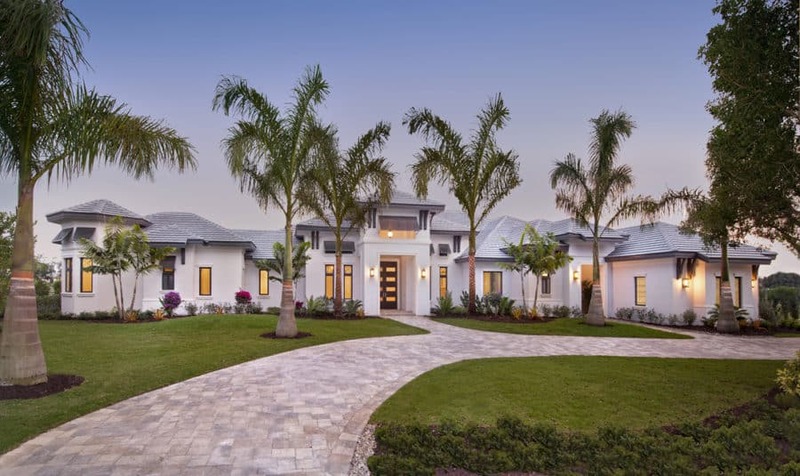 Florida Lifestyle Homes’ trademark attention to detail is evident throughout the home, with architectural embellishments and intricate ceiling treatments in every room. The expansive lanai looks over the lake with its large fountain that lights at night and shines a rainbow most of the day. Automatic screens allow the view with another option that adds screen shutters for protection from the elements and privacy. The outdoor living space captures the essence of the Florida lifestyle with a fully equipped outdoor kitchen, dining space and conversation area in front of the outdoor fireplace. The space include a full bar area with a television. The private and secluded fire pit at the back of the estate property has a sidewalk that goes to the lanai and pool deck and a second sidewalk that allows guests the resort-like feeling of entering their own quarters to the house from the private courtyard. The home has an automated Elan system that controls lighting, music and security as well as many other automated features.